Read a full transcript. Listen to the podcast. In this episode, our group examines the relationship and tension between enterprise-wide SOA and more discrete Web-Oriented Architecture -- what we like to call Guerilla SOA. 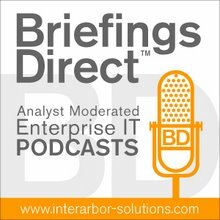 We also look at the probable acquisition of Business Objects by SAP, and the recent Information On Demand conference from IBM. The Web itself and the WOA and the Guerilla SOA are all part of the same trend, which is away from the need for a large corporate IT umbrella, but that you can get things done, satisfy customer needs, be innovative and agile in new markets, and can go global -- all based on not needing one big umbrella, but leveraging what’s able across a rich, fertile, open ecology. About two years ago, IBM established an organizing framework for their data management, database integration, and other data solutions, called Information On Demand, and it’s just a big catch-all for the products they already had, as well as lots of new projects they’ve been developing to address data management under the SOA big top. IBM released 10 press releases, and even those press releases didn’t capture every nuance of every product announcement, enhancement, and initiative they've got going on. ... They announced upgrades or enhancements to their databases, data warehousing products, their master data management (MDM) products, their data integration products under the Information Server portfolio, their enterprise content management products, the FileNet products, plus the preexisting IBM content management products.